Keeping motivated with your health and fitness goals can be challenging at any time of the year, but with the most indulgent season just around the corner, you might need an extra helping hand! There are lots of different health and fitness subscription boxes starting to emerge onto the UK market and one of the newest ones is called Active Monthly. They’ve been up and running since Summer and it’s been great to see their boxes go from strength to strength over the last couple of months. 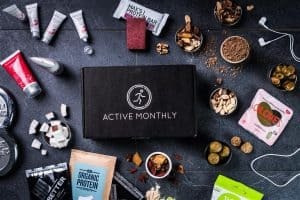 The Active Monthly boxes contain a variety of products from across the healthy spectrum, which can include things like pre and post-workout snacks, high protein supplements and shakes, body care, skincare, healthy drinks, wholefoods, gym passes and more. 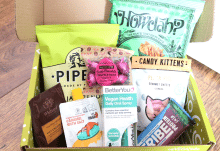 What sets them apart from other boxes though, is that as a subscriber, you can also access their online support and guidance from a team of health professionals so you can view sections such as fitness challenges and nutritionist-approved recipes to keep you on track. 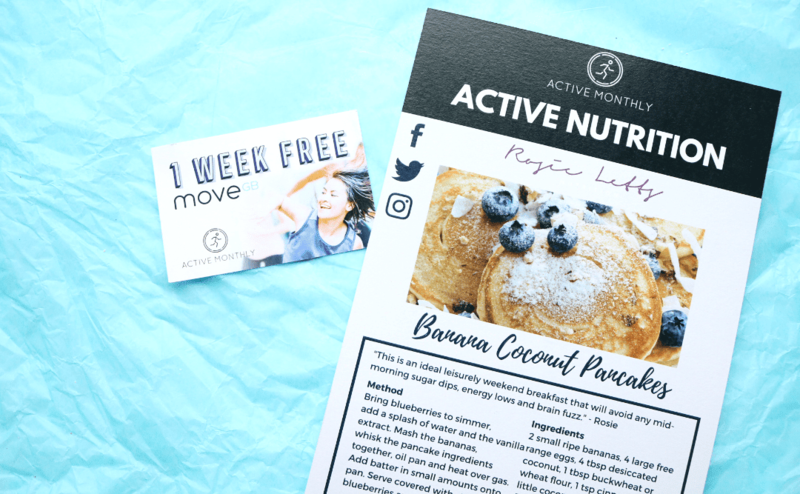 When I opened up the box, I was greeted with some recipe cards (Banana Coconut Pancakes and a Green Smoothie Bliss – yum! ), a Fitness Challenge (you can join in via their Facebook page), and a 1 Week Free Gym Pass from Move GB which can be used at hundreds of local fitness venues. I’ve seen a lot about these Truestart bars on social media and recently tried their Coffee & Peanut flavour which was amazing, so I was pleased to find a different flavour to try! 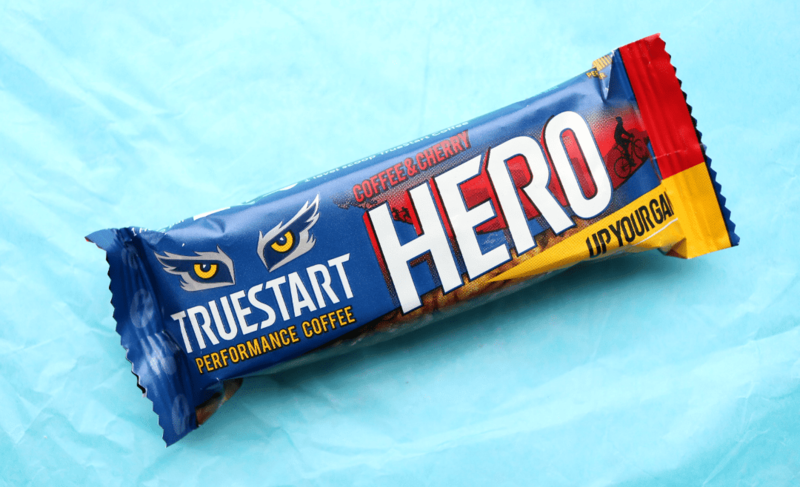 This one is Coffee & Cherry and features a whole scoop of Truestart Coffee to give you a natural caffeine boost. The bar is nice and chewy, with Gluten Free Oats and all-natural ingredients. The Get Fruity Bar is 100% natural, Gluten-Free, Vegan and contains no added refined sugar. It’s packed full of Wholegrain Oats with juicy Cranberries and Blackcurrants – really tasty and a great way to beat that 3pm slump at work or Uni! 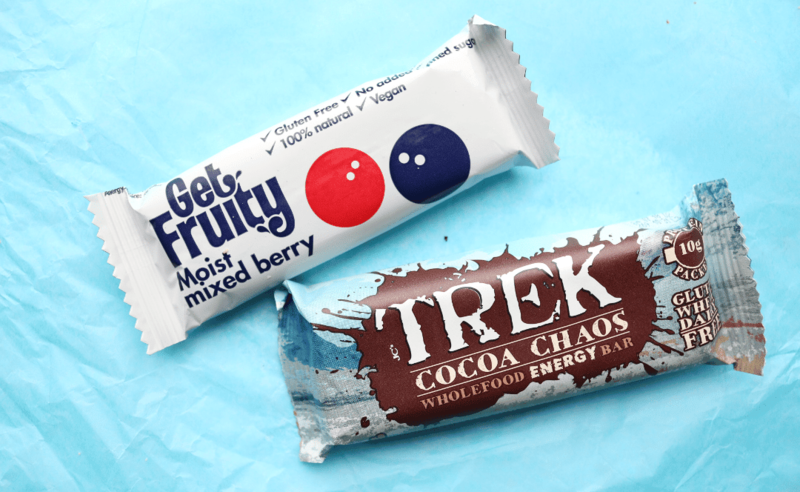 I love these Trek bars and Cocoa Chaos is one of my favourite flavours. These Nut, Oat and Crunch based bars are also suitable for vegans and they are free from Gluten, Wheat and Dairy. Each bar packs in 10g of plant-based protein, making them a yummy option for a quick post-workout snack. 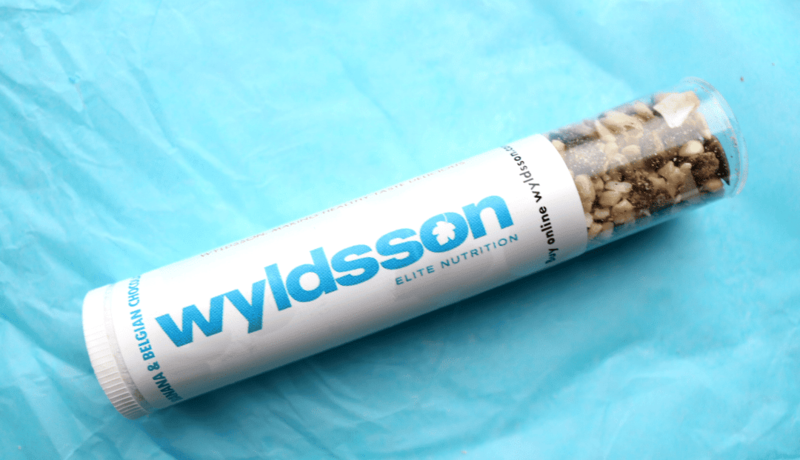 This tube contains a healthy Pro-mix of Nuts, Seeds and Fruits, as well as a little cheeky Belgian Chocolate for good measure. It boasts 15.5% protein, is high in fibre and free from Gluten and Syrups. You can eat it straight from the tube (which is what I did!) or sprinkle it over porridge or cereal for a healthier breakfast. 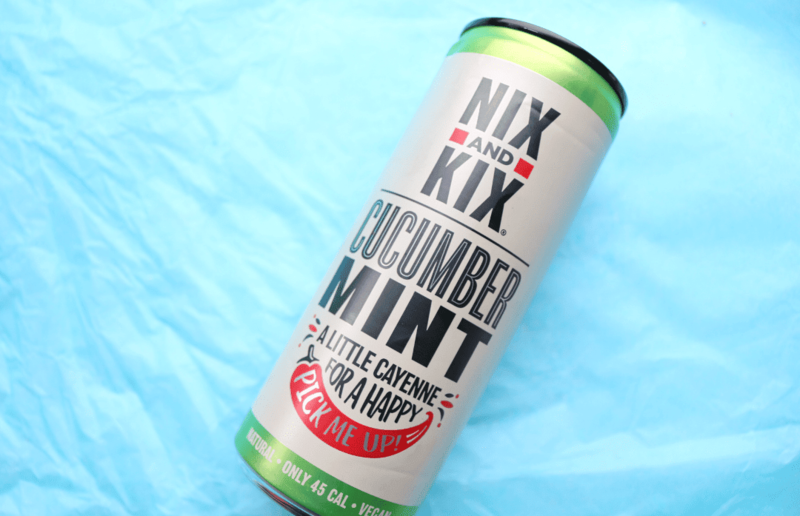 Nix and Kix make a range of healthy but unusual drinks, as they all contain a pinch of Cayenne Pepper for an all-natural boost! It sounds like a little strange and has to be tasted to be believed, but they are really good! This Cucumber Mint flavour was very refreshing and is only 45 calories per can. 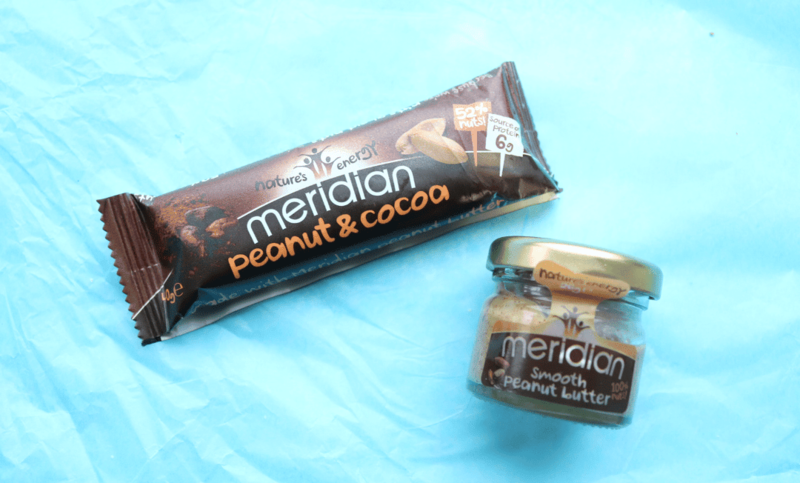 Meridian are one of my favourite brands of peanut butter so I was thrilled to find two products by them in this month’s box! The Peanut & Cocoa Bar is absolutely delicious. It’s made from 52% nuts and contains 6g protein – I really like having these in my desk drawer to keep my sugar cravings at bay. Whereas the small jar of Smooth Peanut Butter is a great way to try out the brand’s bestselling product. 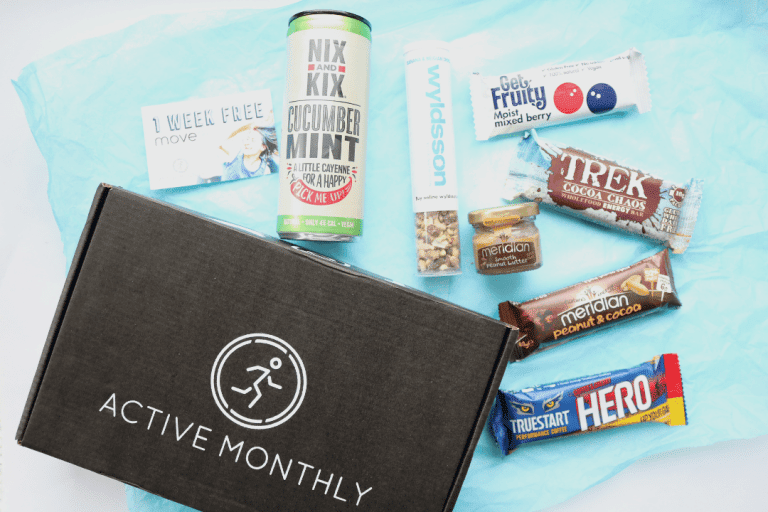 A great box from Active Monthly this month that's packed full of healthy snacks and foods. Enjoyed everything in it! 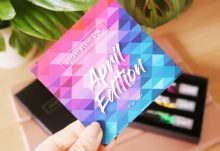 How would you rate Active Monthly ?